Right after the 60th 2016 Whitewater Race, I was emailed an astoundingly clear photograph of Frank and Bill Havens crossing the finish line first place at Sycamore Island in 1956!. Except for the outdated clothing and the high kneeling position, it could have been taken at this year’s race. But no, this image was sixty years old. 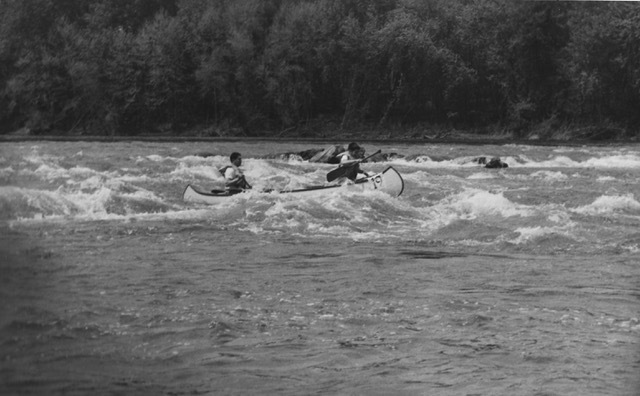 George Malusky, a Sycamore Island member, had been randomly searching Amazon under “old” newspaper pictures and out popped 1956 whitewater racing photos. He ordered them and brought them over. These are not your fuzzy digital, or newsprint images, they are hand printed silver prints, the largest of which is 13 x 8 inches. They were photographed by Richard Stacks of the Baltimore Sunpapers and Aubrey Grave of the Washington Post. The quality is amazing. 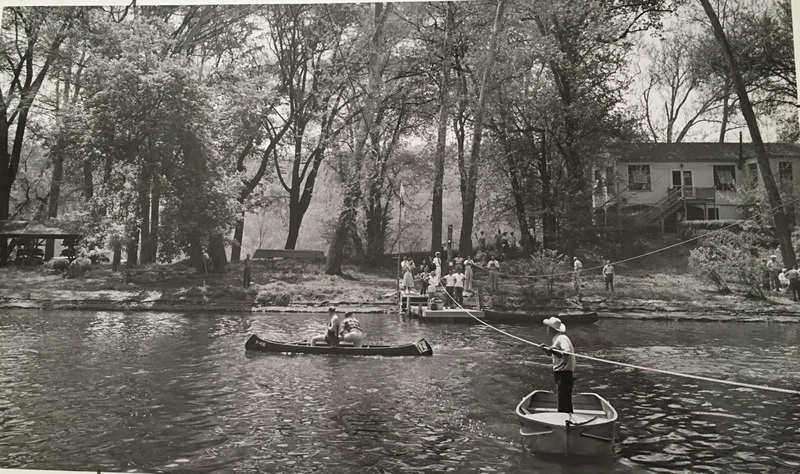 A coalition of the Sycamore Island club, the Washington Canoe Club and the intrepid band of soon to be founding fathers of the Canoe Cruisers Association formed a seven member Potomac River White-Water Racing Committee, chaired by Andy Thomas. Beginning in November 1955, they met at least once and often twice a month planning the race down to minute details. The race course was our seven and one half mile traditional course, from the Rocky Island eddy to Sycamore Island with the exception that racers were required to go through what we call Calico Rapids. Yellow Falls was considered too dangerous. From the pictures, the level was about three feet. On race day, thirty boats registered. Nineteen ran the race; 14 Canadian type canoes and four foldboats. Categories were based on double blades (foldboats) or single blades (canoes). Safety rules were rigidly enforced. All participants had to be accepted by the racing committee. They had to be strong swimmers and experienced racers. 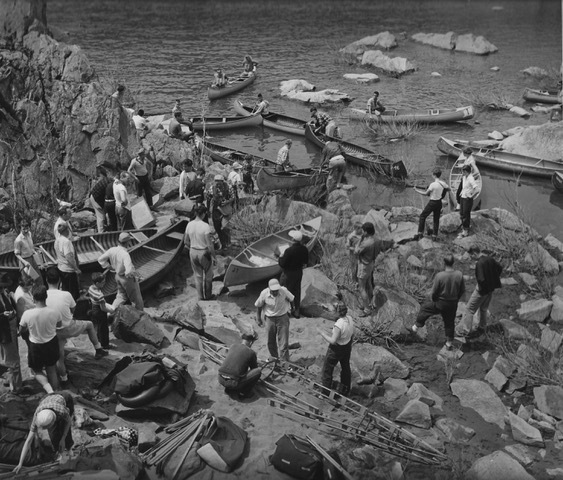 Nevertheless, mishaps occurred, a rock was struck head on, a paddle was lost; and two boats swamped. 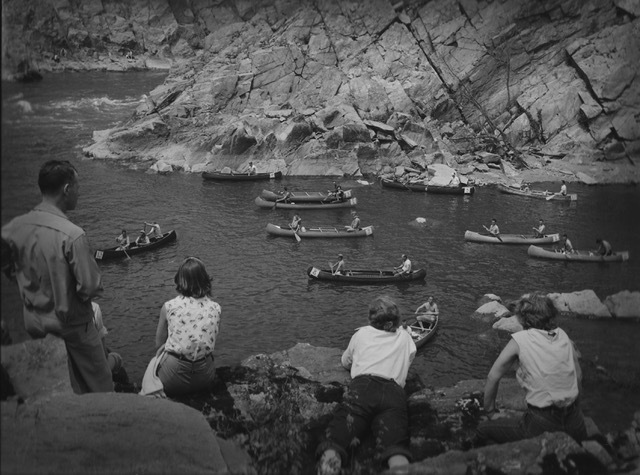 Over 500 spectators watched from the cliffs of Mather Gorge. The names of the negotiated rapids are unchanged, Wet Bottom, Difficult Run and Stubblefield Falls. One hour eight minutes later, gold medal Olympians Frank and Bill Havens crossed the finish line to the snap of a photographer’s camera. Second place, at one hour and fifteen minutes, was earned by Grady Richey and George Boyd. Robert Broad, paddling his 15 foot aluminum canoe with double blades earned third place, one hour and sixteen minutes. Lt. Herbert Williams was first in the foldboats at one hour twenty seven minutes. Other competitors were O.K. Goodwin in a foldboat, Bob Harrigan and Phil Scott in an open canoe, solo canoeists John Berry and Ramone Eaton, and brothers Harold and Ralph Gray in an open C-2. Tom Gray was a spectator at the original race in 1956. A musician at 15, he carried his guitar and was pleasantly surprised to find himself in the photos, plus his father, brother, uncle and two cousins. His father and uncle raced but he does not remember how they placed. * In 1956, ACA (American Canoe Association) was recognized by the International Canoe Federation as the governing body for slalom racing. 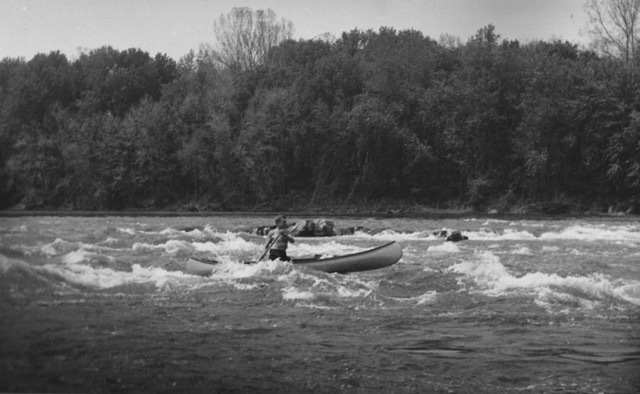 In 1959, wildwater was added.